Published on October 22, 2014 by Martyn. Be the first to comment! In between darfts of my latest teenage novel, I’ve been working on a couple of short stories for adults. 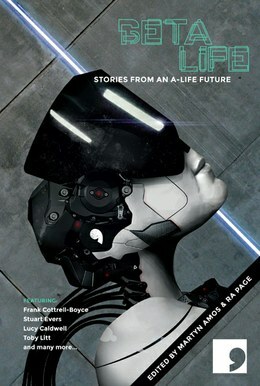 I’m pleased to announce that one of them, The Sayer of the Sooth, has now been published in a new science-fiction anthology – Beta-Life: Short Stories from an A-Life Future – in which all the stories are set in the year 2070. The anthology, released this week by the excellent independent publisher, Comma Press, is the result of a series of 19 collaborations between writers and scientists working in the field of Artificial Intelligence and advanced computing technology. For my story, I was paired with Dr James O’Shea, a senior lecturer in the School of Computing, Mathematics and Digital Technology at Manchester Metropolitan University. Dr O’Shea and his colleagues have spent more than ten years researching and developing Silent Talker, a computer programme which uses advanced facial imaging analysis to detect when someone is lying. It is the most sophisticated lie-detection device ever invented, with an accuracy rate of more than 80% (projected to rise to more than 90%). What particularly interested me about this research was in speculating how far the Silent Talker technology might have developed by 2070. Will we live in a society where lying has become virtually impossible – where anyone can aim a camera, camera-phone or android device at someone else and know, instantly, whether they are telling the truth? In The Sayer of the Sooth, my ‘hero’, Jack, is drawn into an intricate web of deceit – virtual and actual – when he receives the mysterious gift of a book written long before he was born. For each story in the anthology, the writer’s fictional response has an afterword by the expert collaborator, putting the creative piece in its scientific context. The book is the brainchild of its co-editors – Professor Martyn Amos, a colleague of Dr O’Shea’s at MMU, and Ra Page, Editor in Chief at Comma Press. Contributing authors include Frank Cottrell Boyce, Toby Litt and Sean O’Brien. Please click here to find out more and to order copies of the anthology direct from Comma Press.